Seated: R. W. Jack R. Tutzauer, District Grand Master; Grand Master Arthur E. Johnson; M. W. Fred K. Bauer, Grand Master; R. W. F. Brian Emery, Deputy Grand Master. Standing:R. W. Robert M. Blake, Grand Treasurer; R. W. Paul W. Rolston, Grand Secretary. 1999-8: Acknowledgement of new American Flag. 1999-12: Report of the Committee on Records. 1999-55: Greetings to, and appointment of, Grand Representatives. 1999-55: Recognition of the Prince Hall Grand Lodge of Wisconsin. 1999-58: Report of the Committee on Records. 1999-83: Greetings to, and appointment of, Grand Representatives. 1999-86: Report of the Committee on Records. 1999-87: Budget for 2000 (motion only). Should the age requirement to join Freemasonry be lower? Should Grand Lodge set up an incentive program which would reimburse Lodges a set amount of money, based on attaining a predetermined number of new members? Should Grand Lodge reconsider its position on "No Games of Chance"? Should the Grand Lodge Quarterly be held on a different day? Should the Grand Lodge Quarterly be held at a different time? Should Grand Lodge allow shorter periods of time between degrees? Should Grand Lodge continue the requirement for a unanimous ballot for the election of candidates? 1999-147: Greetings to Grand Representatives. 1999-151: Re-election of Grand Master Fred K. Bauer. Election of other Grand Lodge officers. 1999-151: Report of the Committee on Records. Visits by other Grand Lodge officers begin on Page 1999-178. 03/10: 1999-14; opening remarks; Grand Treasurer; CHIP; Masonic Awareness; discipline; One-Day Class; Masonic Forums and candidate instruction; Masonic Home; Shrine Hospital; Grand Lodge dues; meeting with the Grand Master; Grand lodge web site. 06/09: 1999-60; opening remarks; travels; scholarships; MLI; Grand Master's Fair; Grand Treasurer; CHIP; Special Grand Lodge Communication in October; discipline; One-Day Class; Masonic Forums; anti-Masonic activities. 09/08: 1999-89; opening remarks; Special Grand Lodge Communication in October; Wor. Christopher L. Huntoon as Grand Treasurer; December Quarterly, and rededication of building; visitations; discipline; One-Day Class; Masonic Forums. 12/08: 1999-153; opening remarks; rededication of Grand Lodge building; special communication in October; Masonic Home; employment; visitations; One-Day Class; Education; Service; Library; Masonic Home; Insurance; Scholarship; visits; medals. Amendments: Aurora, Joel H. Prouty, Matthew John Whittall, Meridian Sun, North Reading, Republican, Star-Athol, Wayfarers; approved. Amendments: Cochichewick, Corner Stone, Ezekiel Bates, Fellowship, Friendship, Germania, Mariners', Nehoiden, Norfolk, Phoenix, Tahattawan, Thomas Talbot, Waltham Triad, Wampatuck, Weymouth United Masonic; approved. Amendments: Friendship, Germania-Revere, Mountain, Richard C. MacLaurin, Sinim; approved. Amendments: Howard, Lafayette-Greylock, Lawrence United, Montgomery, Morning Star, Phoenix, Waltham Triad, West Roxbury-Dorchester, District Grand Lodge of Panama; approved. 06/09: 1999-56; Rt. Wor. Roy Ernest Handy, Jr., Past District Deputy Grand Master. 06/09: 1999-56; Rt. Wor. Donald Eugene Keene, Sr., Past District Deputy Grand Master. 06/09: 1999-57; Rt. Wor. Edward Newpol, Past District Deputy Grand Master. 06/09: 1999-57; Rt. Wor. Clarence Frederick Penney, Past District Deputy Grand Master. 06/09: 1999-57; Rt. Wor. John Frederick Van Baars, Past District Deputy Grand Master. 09/08: 1999-83; Rt. Wor. Gordon Wallace Weddleton, Past District Deputy Grand Master. 12/08: 1999-149; Rt. Wor. Donald John Lohnes, Past Deputy Grand Master. 12/08: 1999-150; Rt. Wor. Neal Stewart Mitchell, Past District Deputy Grand Master. 12/08: 1999-150; Rt. Wor. William Joseph Rogers, Jr., Past District Deputy Grand Master, Past Junior Grand Deacon. 12/08: 1999-150; Rt. Wor. George Frederick Shelton, Past District Deputy Grand Master. 09/08: 1999-83; Rt. Wor. and Rev. Oscar A. Guinn, Jr., Past Grand Chaplain; presented by Rt. Wor. and Rev. John R.S. Higgins, for the committee. The Grand Master then presented Bro. Higgins with Bro. Guinn's Grand Chaplain's jewel and designated him the senior Grand Chaplain. 06/09: 1999-51. Petition by Meridian and Maugus Hill, as Meridian; granted. 06/09: 1999-53. Petition by Moses Michael Hays and Freedom, as Moses Michael Hays; granted. 06/09: Petition for the consolidation of Germania and Revere, as Germania-Revere; not listed in Proceedings, but should have been; Germania Lodge has a By-Law change in June, and the merger is on 06/19. 04/03: 1999-21. Boston. Cornerstone laying at Shrine Hospital. 1999-22: Grand Lodge opened at the Shriners Hospital for Children. 1999-22: Laying of the corner stone "in due and ancient form." 1999-22: Remarks by the Grand Master and other Brothers. 04/06: 1999-25. Quincy. Centenary of Wollaston Lodge. 1999-26: Grand Lodge opened and was received by Wor. Graeme H. Marsden, Master of Wollaston Lodge. 1999-26: An "interesting, dramatic and inspiring rendition of the first year in the life of Wollaston Lodge" by Wor. Kenneth A. Hamilton and other Past Masters. 1999-26: Remarks by the Grand Master and other Brothers. 04/10: 1999-29. Springfield. 150th Anniversary of Chicopee Lodge of Chicopee. 1999-30: Grand Lodge opened and was received by Wor. George R. Sachs, Master of Chicopee Lodge. 1999-30: Remarks by the Grand Master and other Brothers. 05/08: 1999-33. Needham. 125th Anniversary of Norfolk Lodge. 1999-34: Grand Lodge opened and was received by Wor. Wilfred G. Corey, Master of Norfolk Lodge. 1999-34: Remarks by the Grand Master and other Brothers. 1999-35ff: History of Norfolk Lodge, by Wor. George D. Krech. 06/19: 1999-67. Boston. Uniting of Germania and Revere, as Germania-Revere. 1999-68: Grand Lodge opened and was received by the Masters of the two Lodges. 1999-68: Merger ceremony, described in detail. 1999-71: Charge by the Grand Master; remarks by other Brothers. 09/11: 1999-95. West Brookfield. 75th Anniversary of Bay Path Lodge. 1999-95: Grand Lodge opened and was received by the Brethren and guests of Bay Path Lodge. 1999-95: Presentations, including a Joseph Warren Medal to Wor. George David Valerius. 1999-96: Address by the Grand Master. Remarks by other Brothers. 09/14: 1999-97. Needham. Uniting of Moses Michael Hays and Freedom, as Moses Michael Hays. 1999-98: Grand Lodge opened and was received by the Masters of the two Lodges. 1999-98: Charge by the Grand Master; remarks by other Brothers. 09/24: 1999-101. Rehoboth. 75th Anniversary of Eastern Star Lodge. 1999-102: Grand Lodge opened at the Anawan Grange Hall and was received by Wor. O. Raymond Elting, Master of Eastern Star Lodge. 1999-102: Remarks by the Grand MAster and other Brothers. 10/08: 1999-103. Somerset. 175th Anniversary of Mount Hope Lodge of Fall River. 1999-103: Grand Lodge opened at the Towne Room in Somerset. 1999-104: Anniversary Banquet. Remarks by the Grand Master and other Brothers. 10/20: 1999-111. New Bedford. 50th Anniversary of Wamsutta Lodge. 1999-112: Grand Lodge opened and was received by the Brethren and guests of Wamsutta Lodge. 1999-112: Presentation of colors by representatives of DeMolay and Rainbow. 1999-113: Introduction of the son of Wamsutta Lodge's first Master, and a Charter MEmber. 1999-113: Remarks by the Grand Master and other Brothers. 11/03: 1999-115. Haverhill. Visit to Merrimack Lodge. 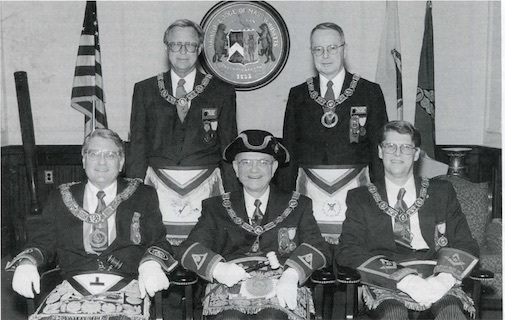 1999-116: Grand Lodge opened and was received by the Brethren of Merrimack Lodge. 1999-116: Address by the Grand Master. Remarks by other Brothers. 11/15: 1999-119. Natick. Uniting of Meridian and Maugus Hill, as Meridian. 1999-120: Grand Lodge opened and was received by the Masters of the two Lodges. 1999-120: Charge by the Grand Master; remarks by other Brothers. 11/20: 1999-123. Ayer. Dedication of Masonic Building. 1999-124: Grand Lodge opened and was received by the Brethren and guests of Caleb Butler Lodge. 1999-124: "The Grand Master and Grand Lodge Officers assembled around the ceremonial carpet and proceeded to dedicate the Lodge building in accordance with ancient usages." 1999-124: Remarks by the Grand Master and other Brothers. Presentations. 1999-125ff: History of Caleb Butler Lodge. 12/02: 1999-129. Hanover. 125th Anniversary of Phoenix Lodge. 1999-130: Grand Lodge opened and was received by the Brethren and guests of Phoenix Lodge. 1999-130: Remarks by the Grand Master and other Brothers. Presentations. 1999-215: Opening and roll call. 1999-221: Reception of guests, including Grand Representatives. 1999-222: Report of Grand Secretary; 622 diplomas issued. List of lodges not represented in Grand Lodge in 1999, as well as the past 2 years. 1999-223: Installation of Grand Master Fred Kirby Bauer. Installation of other Grand Officers. 1999-226: Deputy Grand Master Richard W. Burgess. 1999-227: Past Deputy Grand Master Richard E. Johnson. There were 45 districts in Massachusetts in 1999 (numbered 1 through 33), as well as districts for Chile, China, the Caribbean and Panama. This page was last modified on 31 May 2016, at 17:49.